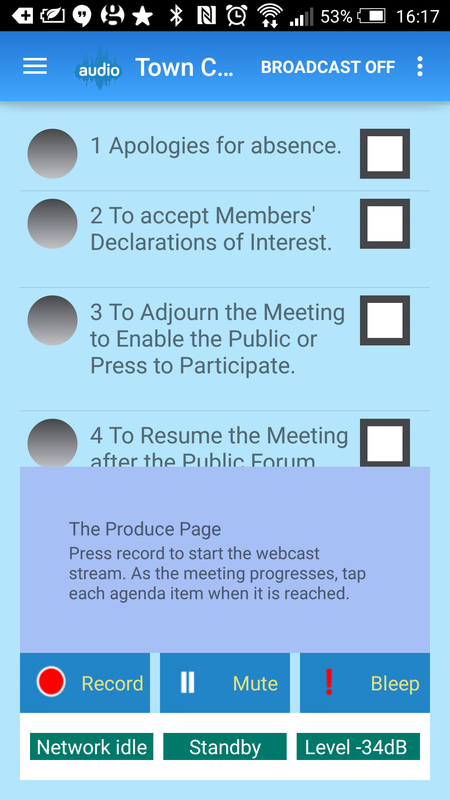 Member of the public are now permitted to record all council meetings. Authorities large and small are choosing to maintain their own ‘official’ version of events, and at the same time, make their meetings more accessible to the people most affected by the decisions taken. 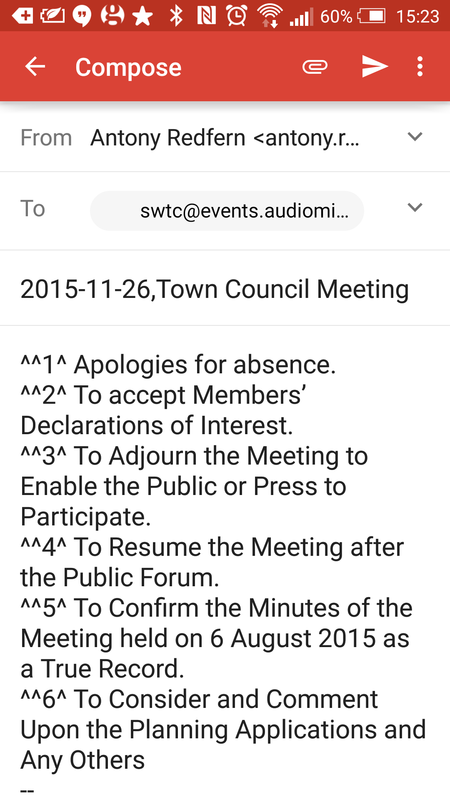 Audiominutes ‘Lite’ version for Local Councils is a simple way to audio webcast public meetings live, and publish recorded meetings on-line. The following explains how to set up the system for your authority. Once you’ve gathered the items required, then go to the Play Store on Google and download the Audiominutes app. 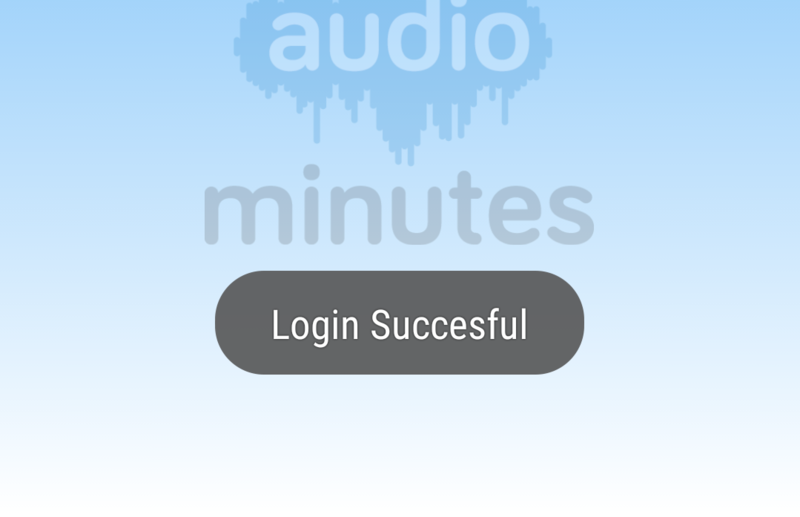 Run the app, then go to the ‘three dots’ menu on the top right of the Audiominutes screen and the add the account name and account password provided. Then press the system back button (on handset – bottom left – not in the app). You should then see a message ‘login successful’. If not, please repeat the process making sure that you use the system back button. We provide a ‘guest’ account so that you can check everything is working without using your main account. To try it, just go to the settings menu again and tick the guest account check-box then press the system back button. Now you’ll see the ‘login successful’ message so go to the main menu (top left) and select ‘Prepare’. Here you’ll see a test meeting ‘Audiominutes Test Meeting’ listed, please select it and you’ll see the agenda items for that meeting (these items may already be highlighted, but don’t worry about that). At this point, the box bottom left will display ‘Network Idle’. Now just press the ‘Record’ button, the button goes red and displays ‘Stop’, and the box below now says ‘Network up’. Congratulations – you are now audio webcasting. You can hear the stream here www.audiominutes.com/guest. 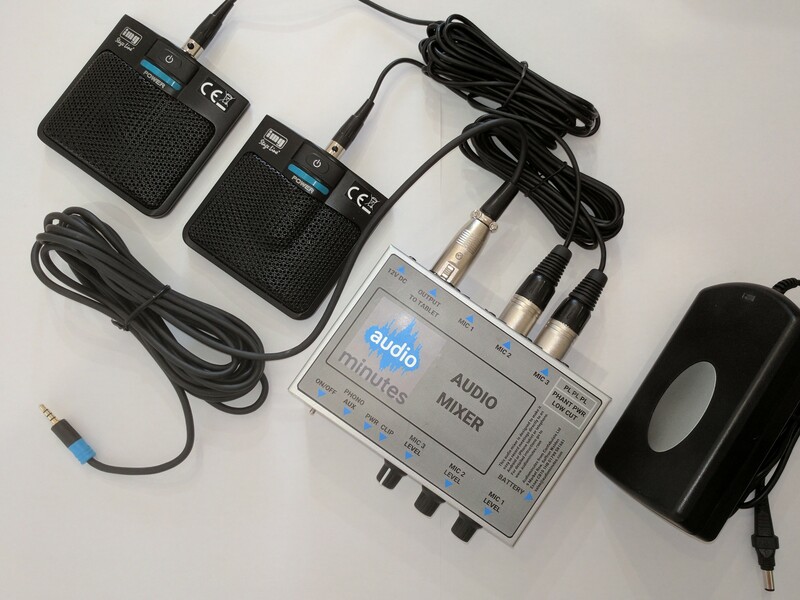 Now position the Go-Mic in the middle of your table and try a test broadcast using the Guest account to check audio levels – when recording you should see the level indicator (bottom right) going from -30 dB up to -0dB. Press Stop to bring the meeting to a close and follow the instructions to publish the meeting. ^^2^ To accept Members’ Declarations of Interest. ^^3^ To Adjourn the Meeting to Enable the Public or Press to Participate. ^^4^ To Resume the Meeting after the Public Forum. ^^5^ To Confirm the Minutes of the Meeting held on 6 August 2015 as a True Record. If you wish to update a meeting, for example, add a new agenda item, then send the complete modified email from and to the same email address, with exactly the same Subject line as before, the modified meeting will overwrite the previous version. You will then receive an email confirming that the meeting has been set up and you’ll see the meeting appear in the app. Having got to this point, the rest is easy. Before the meeting, plug your fully charged Android device into the Go-Mic microphone through the USB host cable. Please note that you can’t charge the device while the USB host cable is plugged in. Select your meeting using the ‘Prepare menu’, then a moment or two before the meeting starts, press record and check that the ‘Network Up’ message is displayed. 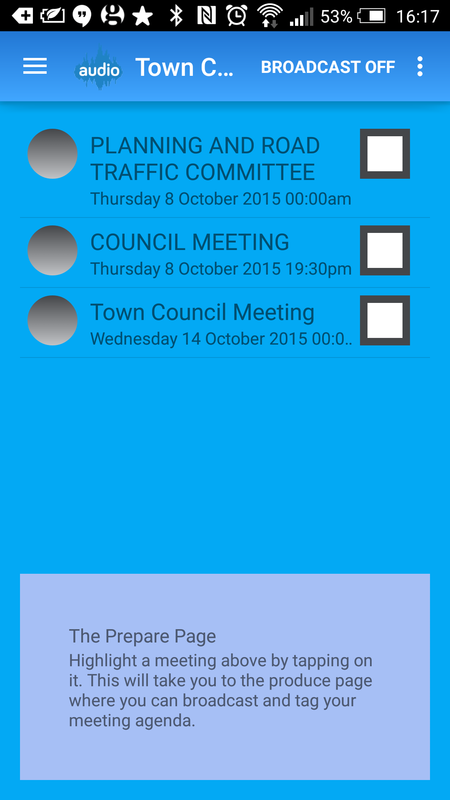 Now, as each agenda item is reached, check the appropriate item on the handset. You can select these items out of order if you want, and if you forget, don’t worry as you can re-check items later if required. You can mute the meeting by pressing the mute button and black out profanities with the bleep button. In the event that your WiFi or 3G connection fails during the meeting, then your meeting will still be recorded to your handset, so just leave the meeting running and you can synchronise the meeting afterwards. 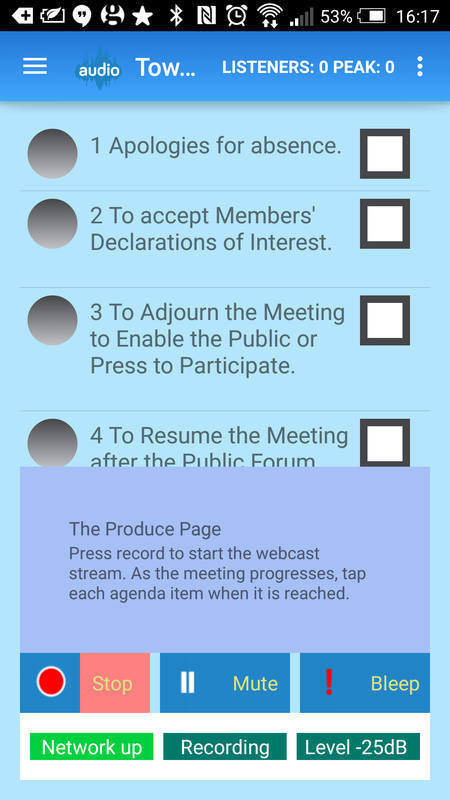 Bringing the meeting to a close is a case of pressing stop and accepting the ‘Yes’ option dialogue box. Audiominutes can send out Tweets over your Twitter account when meetings start and stop if required – please email us for details. Although it’s always nice to hear from our clients, we need to keep the communication between us to a minimum; otherwise our pricing model won’t work – please check our FAQ and these instructions first, then, if you still can’t find the answer you are after, email us at support@audiominutes.com – thanks.